My guest this week has written a psychological thriller in which two former school friends confront a life-changing event from their past. To create their teenage years in the 1980s, the author delved into her own archives, discovering old mixtapes and an Elvis Costello LP whose sleeve contained a lyric sheet written out by a close friend. She was struck by the way music became less significant over the years. What had once been such a fierce marker of personal identity was now an emblem of a simpler time – though not necessarily for the characters in her novel. She is Women In Journalism advocate Meg Carter and she’s on the Red Blog with the Undercover Soundtrack for The Lies We Tell. My guest this week has written the story of a marriage. Her novel spans many decades, from when her protagonist is a 17-year-old debutante in the 1930s, to the swinging sixties, where the character finds herself revisiting old haunts and sifting through her memories and her hopes. It’s a poignant post, honest and searching, and full of loss. She is Clare Flynn and she’s on the Red Blog with her Undercover Soundtrack. The band is about to split. Our magnificent seven will soon scatter. The box set containing our seven novels will evaporate at the stroke of midnight BST on Saturday 23 May. We might even resume our normal colours. Here’s a post that explains the box set experiment. Here’s one where we were asked just what kind of political statement we thought we were making. And, in case you feel like tackling a similar venture, here’s one where we explain lessons learned. So, for the final time, you can get the box set on all ebook platforms here. And in the meantime, I’m taking a blogging break this weekend, but I’ll be back with The Undercover Soundtrack as usual. See you there. I have been looking forward to sharing this Soundtrack with you. I’ve known the writer for a number of years on social media as we’ve moved in the same Venn diagrams, but when I saw the pre-publicity for her latest novel I had to approach her for this series. One of the hallmarks of these posts is that they are deeply personal journeys, and this novel is perhaps an ultimate example – it’s based on true events, the suicide of her husband. Do you recognise her already? If you’re in our Venn diagrams, perhaps you do. Before I confirm her name, let me say a little more about the music. This Soundtrack is a series of songs that reached out of the radio at the right time, to comfort, add perspective or share a moment; to make it possible to create a novel out of such a happening. She is Kathryn Craft, and she’s on the Red Blog with the Undercover Soundtrack to The Far End of Happy. My guest this week returns for her third appearance on The Undercover Soundtrack. And it’s for her first novel, which she’s reissuing in a director’s cut, after reclaiming the rights. Plotlines and characters have been reimagined according to her original vision, and music was vital to recreating the book in her mind. Indeed, the story began in music, as she initially didn’t even realise her idea was destined to be a novel. She relates in her post how she’d sit on a gantry with guitar and writing pad, imagining a stage play with songs. But then the back story began to take shape, and the subtext, and before she knew it, a novel was born. She is NYT bestselling author and ghostwriter Joni Rodgers, one of my partners in crime at the Women Writing Women box set, and she’s on the Red Blog with the Undercover Soundtrack for the novel she contributed, Crazy For Trying. 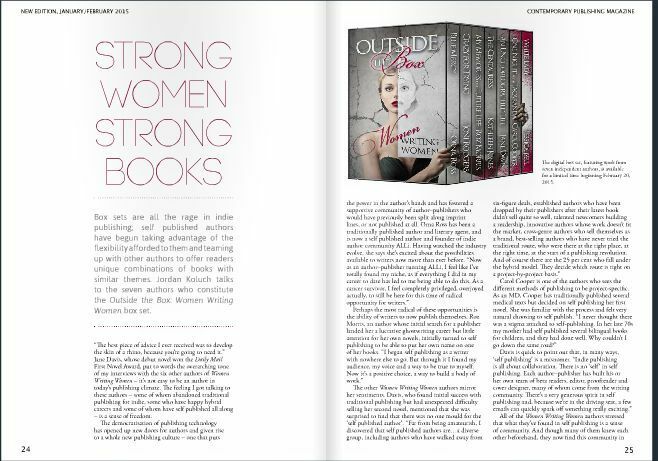 LIMITED OFFER Psst… Outside The Box: Women Writing Women is available only until 24 May. 7 full-length novels for £7.99 or the dollarly equivalent, including My Memories of a Future Life by yours truly. And it vanishes on 24 May. My guest this week is a master of many storytelling disciplines – including screenwriting and radio as well as prose fiction. She’s currently writing an action-adventure screenplay set during the Russian Revolution, with a decidedly spooky twist. Her soundtrack includes Holst, the romantic 20th century composer George Butterworth and a haunting, melancholy piano piece she discovered on an album of Chinese composers. Best known for creating the TV series Wolfblood, she is Debbie Moon and she’s on the Red Blog with her Undercover Soundtrack. How do we label ourselves as writers? Guest spot at Dan Holloway – and the box set is available NOW! Forgive the capitals in the title. That’s the problem of being in a group of seven, rather excited writers who’ve been working towards this moment since November. 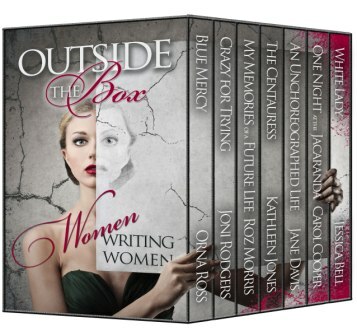 Our ebook collection, Outside The Box: Women Writing Women, went live yesterday. If you pre-ordered it, it will have arrived on your ereader. If pre-orders aren’t your thing, you can grab it right now, because it vanishes on May 24. Oh, and it’s seven full-length novels, so clear a weekend or seven. Is this collection a marketing idea, a political statement or both? What are our common threads (aside from the possession of two X chromosomes)? Do they help us come up with a ‘label’ for our diverse range of books? What should that label be? Do labels in fiction cause problems? What about the position of women writers in literary fiction? And, my own favourite: is it better for writers to be ambitious and fall short, or to succeed on more limited terms? It’s a good discussion. Do come over. And once again, this is our ensemble. And we are very excited. My guest this week brings a real blast of the 1980s, with a bright red emphasis on romance (I guess it’s that time of year). She drew on the soundtrack of her adolescent years to create the love-torn characters in her novel, and the heart of the story beats to George Michael, Berlin and Patrick Swayze. She is Audrina Lane and she’s on the Red Blog with her Undercover Soundtrack. My guest this week says she was a singer long before she was a writer, and when she started writing, music was a natural place to find story inspiration. She writes a series of novels based around the members of a book club, and many of the titles and characters come from tracks that have been special to her. I took unashamed pleasure in seeing Icicle Works and Peter Gabriel make an appearance – the latter with Sinead O’Connor (gasp). And one of her books was inspired by a track by Indigo Girls, which talks about reincarnation and the soul reinventing – possibly a familiar idea to longtime visitors here. Anyway, she is award-winning journalist and contemporary women’s fiction author Karen Wojcik Berner and she’s on the Red Blog with her Undercover Soundtrack. My guest this week is one of those many writers who values silence – but is keenly aware that music is influencing what comes out on the page. She describes how music acts as a portal, letting her access moods and mental states in order to recreate them faithfully in her fiction. She describes trying to capture a state of longing and nostalgia, but without sentimentality and the soundtrack she shares here is such a treat: a Gershwin cover by Kate Bush; a Purcell lament sung by Alison Moyet. If you follow my show on Surrey Hills Radio you might hear me finding an excuse to give them airplay sometime soon. Anyway, this imaginative guest is wartime romance author Davina Blake (who also writes historical novels as Deborah Swift), and she’s on the Red Blog with her Undercover Soundtrack.